Is the use of the serial comma ever wrong? Would you personally use it consistently in your writing? Is the use of the serial comma ever wrong? 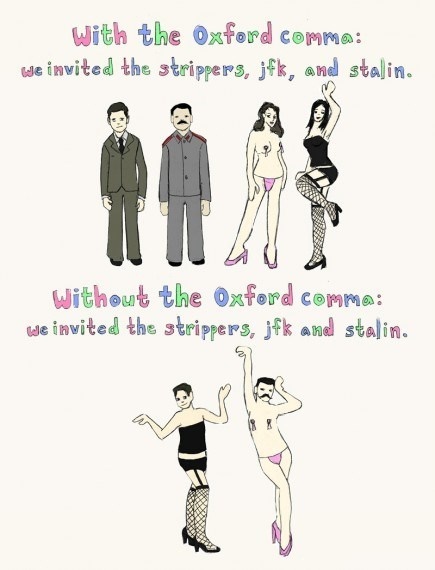 Here is a pretty current discussion of this so-called 'Oxford comma'. Would you personally use it consistently in your writing? No, never, if you mean in simple cases like I like apples, oranges, and bananas. Moreover, I've never personally encountered the Oxford comma in use in Oxford in such cases. Thanks, Clive. Have a nice weekend. I, on the other hand, will never stop using the Oxford comma, whether in letters, essays, or even journal entries. Clive Here is a pretty current discussion of this so-called 'Oxford comma'. victo Is the use of the serial comma ever wrong? No, of course not. In fact, it usually doesn’t matter whether you use it or not. victo Would you personally use it consistently in your writing? victo Is the use of the serial comma ever wrong? Would you personally use it consistently in your writing?Thank you. It's always wrong in a simple list, and it's always right in a complex one. If its presence or absence causes ambiguity, recast the sentence instead of pinning your hopes to a punctuation mark.